Fancy a cup of grilled coffee? Ubisoft’s new open world racer has some impressive scenery, whether you’re bombing along the Pacific coast or through the Nevada desert at sunset. But when I slowed down and took a closer look at its cities, I noticed something strange. The storefronts that line the streets are truly bizarre, like they’ve been generated by some malfunctioning computer. Maybe they have? I don’t know the tricks developer Ivory Tower uses to build these gargantuan maps. But I do know that, close up, its version of the USA is bloody weird. We'll have a full review of The Crew 2 tomorrow. In the meantime, enjoy some French ravioli and pizza pizza grilled pizza. 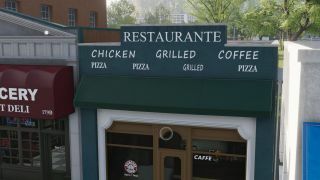 This eatery not only serves burgers (the best, apparently), chicken, and pizza, but grilled coffee too. I can’t say I’ve ever grilled coffee before—I prefer soaking it in boiling water myself—but maybe it’s a local tradition in LA? This French restaurant boasts a range of classic Gallic dishes including, uh, ravioli, fettuccine, and tortellini. Culturally ignorant restaurateur or some kind of bold fusion cuisine, perhaps? It's difficult to tell. This raises several questions. Why would anyone ever need 24-hour access to an antiques shop? And if it’s open all day, why is it closed? Maybe the auctioneer stepped out for a few minutes to grab a cup of grilled coffee. The peculiar placement of this ATM is one of The Crew’s most alluring mysteries. Why has it been placed in some old vacant lot? And hidden away from the street behind a fence? One can only guess. City living can be expensive, but luckily there are places like this motel where you can rent an apartment for the low, low price of just $3B.9B a month. And it’s open 7 days a week, which you’d hope somewhere you live would be. Ah, yes. Because when you fancy a beer, the most important piece of information a bar can provide is how fresh its drinks are. Cold drinks? Pfft, just tell me how fresh they are, buddy. I need that fresh beer. This gift shop appears to have a sideline in facials, waxing, nails, and body massages, which is some impressive diversification. And they've been doing it since 1924 apparently. They loved bikini waxes in the roaring '20s. If you thought a hot, steaming mug of freshly grilled coffee sounded good, try chicken grilled coffee on for size. And don’t forget to order that Californian classic to go with it, the pizza pizza grilled pizza. It’s grilled! Good luck getting into this San Francisco restaurant for a slice of pizza pizza grilled pizza, because someone appears to have stolen the stairs. Another small business destroyed by crime. This city's going downhill. Literally. Do you need munti-functional spray paint, whatever that is? Or how about a weirdly specific 77 different kinds of paint? Then Paint Store, the store that sells paint, is here for you, my friend. You want paint? We got it. Now this one is a real enigma. The signage claims it’s a pharmacy and a grocery store, but look inside and you see what is clearly a high-end fashion boutique. I’m so confused. But maybe it's an art thing. This multi-tasking store provides every service a person could ever want. Furniture, tailoring, cleaning, appliances, and SHOE. Because sometimes you just need a single shoe. Not a pair, but a solitary shoe. You can get a room for the night, your car fixed, breakfast, a spa treatment, and your armchair fixed in this establishment, all under one roof. Now that’s what I call a diverse business. And so efficient. Sign me up for a loyalty card. Do you need circular dots? Then Circular Dots has you covered. What even are circular dots? Well, uh, I have no idea. But this store sells ‘em, and that’s good enough for me. Circular dots. Dots that are circular. It’s a shop, but what does it sell? There’s a picture of a woman with billowing hair in the window. Maybe it sells them. But who knows, really. All I know is that it’s a shop, and sometimes that's all the information you really need. I don't know what this shop sells either, but I do know that it's the best. And if you need the very best of some unspecific item, then this mysterious store is clearly the place to spend your hard-earned money. It's the best. Clothes boutique Alessandra is sadly going out of business. But the benefit for its customers is that if they BUY ONE they get SECOND ONE, which is nice. LA is an expensive city, so deals like this should be taken advantage of. Ah, so that’s where they all come from.